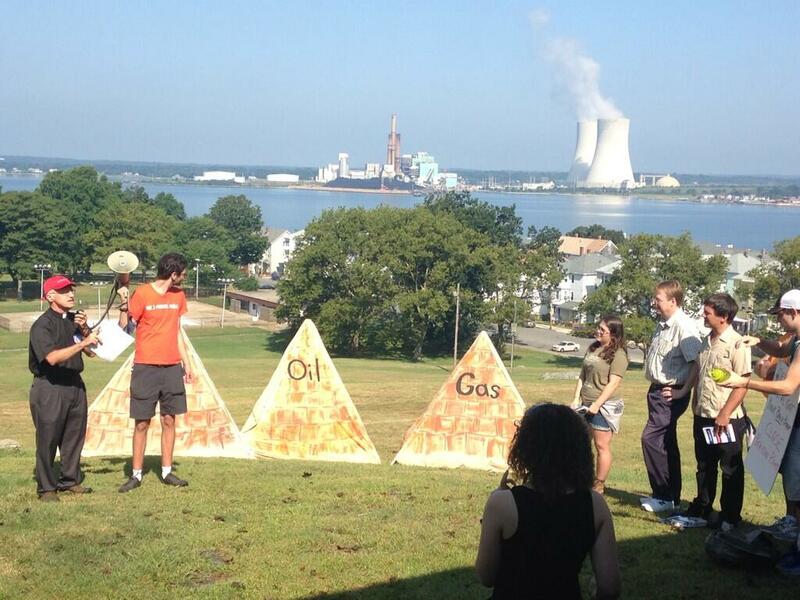 Remarks delivered in Fall River, MA at the Energy Exodus Climate March, August 28, 2013. Let me begin by thanking 350Mass and A Better Future Project for imagining that this march could happen! .... Events like this require months and months of planning and we are so grateful to the entire leadership of 350 Mass and A Better Future Project!! And then I want to thank all of you who are undertaking this march! Thank you for your time; thank you for your commitment; Thanks to your friends and loved ones whose support is making it possible for you to witness in this way. Four years ago some of us camped out on the Boston Common because Craig and Marla and Vanessa and other visionaries were already showing the kind of leadership that has brought all of us together today. Since then, we’ve pedaled, picketed, paraded and petitioned on behalf our home.... planet earth. What a privilege it’s been over the years to stand with this community of truth-tellers. the gift of creation is restored. Is that too much to hope for? Is that too much to aspire to? Well – not if the name of this march is “Energy Exodus!” An exodus is a movement from one place to another; from one way of life to another; from captivity to liberation. So it was for the Hebrew people 3,300 years ago, and so it is for us today. and its relentless addiction to mobility. The last time I looked, material growth, convenience and mobility were not moral values! balance in place of addiction. While this march is inspired by courageous moral giants like Susan B. Anthony, Gandhi, Dr. King and Cesar Chavez – Bill McKibben reminds us that our movement is a leaderless movement because we recognize that the people have the power, and if our planet is to survive, the power will need to be re-distributed from its current concentration in corporations. Thank you for engaging this difficult work! I spent last Thanksgiving vacation giving thanks for the wonder of Creation – and writing a resolution for my denomination, the United Church of Christ. Like many of you, I read Bill McKibben’s article in Rolling Stone Magazine. "Global Warming's Terrifying New Math" is, in a way, simple. Fossil fuel companies own – or have the right to tap – five times the amount of carbon it will take to alter life as we know it. If fossil fuel companies simply continue to carry out their business plan – life as we know it will cease. Can we create the moral conditions that will cause those companies to leave 80% of those carbon reserves in the ground? I believe we can... and we must! I believe that you and I, together with millions of others, have the power to revoke the social license fossil fuel companies require to continue to carry out business as usual. Since McKibben’s article was published a year ago, over 470 colleges, universities, cities, towns and now faith groups have initiated divestment campaigns. And on July 1, the national gathering of the 5,000 churches of the United Church of Christ became the first denomination to divest from fossil fuel companies. Within 3 hours of that vote, I received congratulations from Bill McKibben, a Harvard Nobel Prize winner, the head of another major denomination and from Archbishop Desmond Tutu. Never forget - in concert with other political and popular forces - you and I actually have the power to bend the arc of justice. That’s what this march is all about. That’s what the movement to stop the Keystone Pipeline is all about. That’s what the growing, massive divestment campaign is all about. Put it all together and soon, Exxon Mobil will no longer be regarded as a prudent investment. Within our lifetime, mining coal, drilling for oil, mountain top removal and fracking will all be as unthinkable as it would be to own slaves today. it’s easy to feel like we’re up against Goliath. But in your eyes, I see the courage, enthusiasm, confidence, commitment and resolve that can topple even Goliath. Thank you for your leadership as we convince our sisters and brothers to end our assault on nature, by leaving fossil fuel in the ground, and harvesting the sun and the wind instead. May the God of many names bless you in the journey ahead.
. http://climatechange.worldbank.org/content/climate-change-report-warns-dramatically-warmer-world-century According to Jim Yong Kim, President of the World Bank, in their November 2012 report, "Why a 4 degree centrigrade warmer world must be avoided". See also his January 24, 2013 Op-Ed piece in the Washington Post: op-ed piece in the Washington Post. Many scientists now believe that before the end of the century, CO2 will reach 866ppm, and global temperature will rise over 5° Celsius. See 2009 MIT report: http://thinkprogress.org/climate/2009/05/20/204131/mit-doubles-global-warming-projections-2/ and 2012 Price Waterhouse Coopers report: http://thinkprogress.org/climate/2012/11/06/1144431/study-were-headed-to-11f-warming-and-even-7f-requires-nearly-quadrupling-the-current-rate-of-decarbonisation/ .